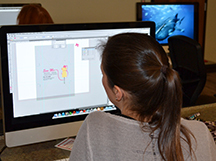 Located in the beautiful Alabama Center for the Arts in downtown Decatur (see maps page), the Computer Graphics Program is designed to teach the practical application of artistic skills to projects encountered in business and industry. Both options teach basic skills and concepts and current techniques and applications. A good foundation is offered in drawing, design and art history. The student is encouraged to use these skills to develop a portfolio to use in finding employment. In recent years, the computer has become an important tool for the designer. Students in the Computer Graphics Program have access to a computer lab equipped with the latest industry standard hardware and software. Courses are designed to teach the creative application of these programs to projects that would be encountered in the workplace. Both individual and team approaches to problem solving are practiced. This program is for those interested in refining artistic talents and in preparing a professional quality portfolio in order to strengthen employment possibilities. 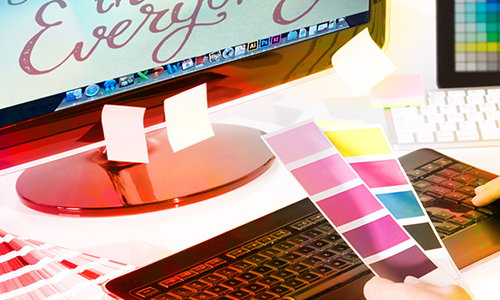 Courses in graphic design, advertising, computer graphics and technical illustration are emphasized in this program. Some courses are offered only once a year in the day program on the Decatur campus. Students should plan schedules with the advice of the art faculty. A formal review of a professional quality portfolio of the student’s work is required upon completion of the program of study. This program is for those interested in refining artistic talents and in preparing a professional quality portfolio in order to strengthen employment possibilities. 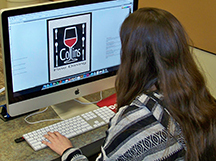 Courses in graphic design, advertising, computer graphics, technical illustration, and multimedia production are emphasized in this program. Some courses are offered only once a year in the day program on the Decatur campus. Students should plan schedules with the advice of the art faculty. A formal review of a professional quality portfolio of the student’s work is required upon completion of the program of study. Option II offers a greater emphasis on Computer Graphics/Electronic Imaging. This program is for those interested in refining artistic talents and in preparing a professional quality portfolio in order to strengthen employment possibilities. Courses in graphic design, advertising, computer graphics, technical illustration, multimedia production, and animation are emphasized in this program. Some courses are offered only once a year in the program on the Decatur Campus. Students should plan schedules with the advice of the art faculty. A formal review of a professional quality portfolio of the student’s work is required upon completion of the program of study. Option III offers a greater emphasis on Graphic Animation/Electronic Imaging. 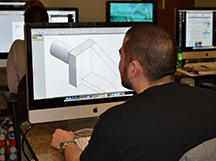 A variety of software packages are utilized in the computer graphics program, including the industry-standard packages, providing students with the background they need to become competitive in the field. Blender is used in CAT 283 3-D Graphics and Animation, ART 283 & 284, Graphics Animation I and II. These classes are offered one night per week from 4:30 – 9:45 p.m. The instructors are working in industry as animators. Blender has won runner-up in Mac Competition. This validates the use of the open source software Blender used in our class. Many Students ask about this software. Some students enroll in this program at entry level. Others enroll for job advancement or to learn new skills for a variety of reasons. Graduates may be employed in the printing industry, an in-house advertising department in a technical or manufacturing firm, an advertising agency or marketing firm, a video production firm, at a magazine or newspaper, or at a variety of other businesses. Some graduates prefer to work free-lance or start their own businesses. A few examples of area firms employing students from the program include Graphic Color, Precision Graphics, United Technologies, Adtran, NASA, Tennessee Valley Press, The Decatur Daily, American Graphics, and Huntsville Utilities.